Bob Ward is a contributor of poetry, an essay, and photographs to Amsterdam Quarterly. 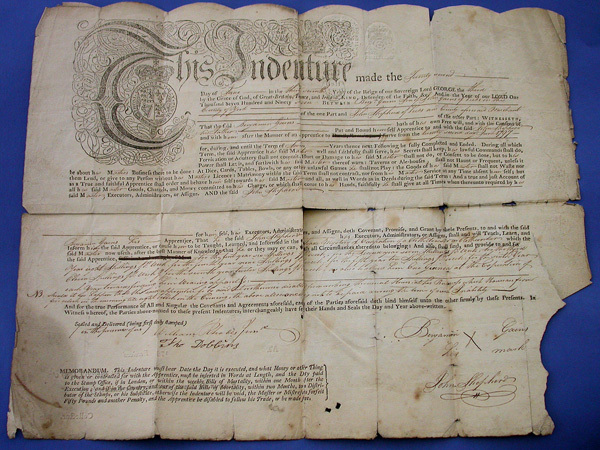 He discovered this indenture document of Benjamin Gains, a distant but direct relative, folded up and tucked away in the corner of a family Bible. He photographed the document using a Canon 20D SLR fitted with a 50mm macro lens in natural light and no flash to prevent damage. This document is now stored in the West Yorkshire County Archive, which will ensure its preservation.